The court of the ageing Elizabeth I is a glamorous place, populated by handsome young men and beautiful young women competing for the Queen’s favour; a place where skill in wit, art, gambling and flattery counts for everything. Shining brightest amongst all these bright gems is Penelope Devereux, a relation to the Queen and as clever and as politically astute as she is beautiful. Few women are more hated by Elizabeth than Penelope’s mother – who dared to marry the royal favourite Lord Leicester – and yet Elizabeth comes to regard Penelope as almost a daughter, watching over her with Leicester by her side, a parody of Penelope’s parents. And when Penelope’s handsome, impetuous brother Robert, Earl of Essex, arrives at court, the strange family is complete. Elizabeth is bewitched by the young man, all the more when Leicester finally dies. As the star of Essex rises, there seems nothing this impetuous young man can’t achieve and his eyes are set very high indeed, all the time watched and advised by his shrewd and equally ambitious sister. The peacocks don’t have it all their own way. In these dangerous days of Armadas, Jesuit assassins and an uncertain succession, Elizabeth relies more than ever on the wise men of her court, notably her trusted chief advisor William Cecil, Lord Burghley, and, increasingly as his father ages, Burghley’s son Robert Cecil. But how different the younger Cecil is from his contemporaries Penelope and her brother. Nicknamed ‘Pygmy’ by the Queen, Cecil finds solace in plotting the demise of the Devereux siblings, seeking out evidence of treachery. As the years pass it becomes clear that Cecil’s obsession may be rewarded. 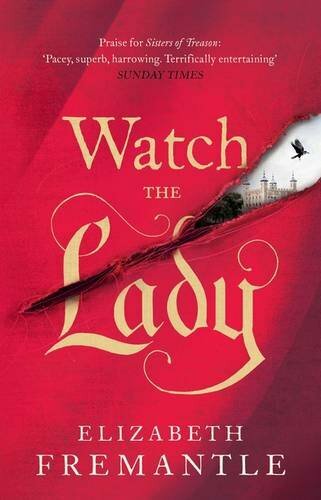 Watch the Lady is a glorious novel, rich in Tudor colour and splendour, chilled by Tudor cruelty and jealousy. Penelope Devereux is a fascinating woman and in this novel we watch her life move backwards and forwards in time, the tenses shifting as we move from the past and settle into a present in which the Queen is fading, watched closely by Essex. The novel covers twenty years or so and during that time we get to know Penelope very well and she is a glittering companion. The novel might be about ambition and power but it is also about love. The strange love of Elizabeth Tudor for Leicester and then Essex is nothing like the love that fuels Penelope through her life. She becomes the muse of the warrior poet Sir Philip Sidney, his ‘Stella’, but this love, which lasts for many years, is superseded by an even greater one. Watch the Lady presents a beguiling portrait of love in many of its guises and I found that element of the novel captivating, bringing to life as it does some of the most charismatic personalities of the late Elizabethan court. Where there’s love there’s often hatred and the depiction of Penelope’s flawed husband Lord Rich is a memorable one and a highlight of the novel. The relationship between Penelope and Cecil is another significant thread through the book. Our perspective shifts between the two, making it easier to glimpse the misunderstandings and the suspicions. As the novel progressed, I surprised myself by beginning to care for this odd and yet enormously capable man. The Elizabethan court was not a ‘normal’ place. It affected people. Two characters remain harder to know – Elizabeth the Queen and Essex. These astonishing personalities are presented through the eyes and experiences of others and when there’s friction between the two – or worse – the whole court shakes. It’s not often fiction gives us Elizabeth during her later years and I liked this portrait of her very much. I found Essex especially hard to warm to but, as there’s a strong sense that he cared little for himself beyond his arrogance, that is unsurprising. Other characters made up for it, especially Charles Blount. I enjoyed the glimpses of famous poets, artists, thinkers – and even a certain playwright. Elizabethan culture plays an important part in Watch the Lady. Everything, though, is overshadowed in the later part of the novel by rebellion, the threat of war, revolt and treachery. At this point the book becomes an enormously exciting historical thriller, dominated by the personality of Penelope Devereux, finally coming into her own as a warrior figure to rival Elizabeth, such a contrast to the young submissive child, so new to court, of all those years before. Watch the Lady is the third novel by Elizabeth Fremantle to bring key (and overlooked) Tudor women to the foreground – Katherine Parr in Queen’s Gambit and Mary and Katherine Grey in Sisters of Treason. Penelope Devereux is another worthy subject, providing a fascinating perspective on a less familiar period of Tudor history, and Elizabeth Fremantle, such a fine writer, has done her justice. This entry was posted in Historical Fiction, Review, Tudor and tagged Historical fiction, Tudor on June 18, 2015 by Kate (For Winter Nights).